Graves' disease is an autoimmune disorder characterized by an overactive thyroid gland, which produces an excessive amount of thyroid hormones. Thyroid gland is a butterfly shaped gland situated in the neck, below the Adam’s apple. 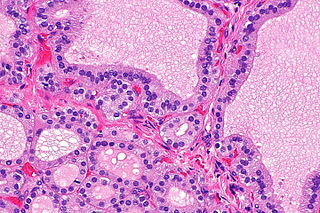 This is one of the largest endocrine glands in the human body that controls several important bodily processes. Thyroid gland controls the body’s metabolic rate, or the pace at which the body uses energy. It also controls how quickly the body makes proteins and to what extent it is sensitive to other hormones. In Graves' disease, a serious metabolic imbalance takes place, since the levels of thyroid hormones are abnormally elevated. Graves' disease is the most common cause of hyperthyroidism in all age groups. The disease typically starts during early adolescence and includes all of the symptoms of hyperthyroidism. Most of the patients will develop enlarged thyroid that looks like a huge swelling at the base of the neck. This phenomenon is also known as goitre or goiter, and may include other complications such as vocal cord paralysis, dysphonia, and even respiratory stridor. Another common symptom of Graves’ disease is the protrusion of eyes, also known as Graves’ ophthalmopathy. This disorder affects the orbit around the eye, causing the upper eyelid retraction, swelling, redness, conjunctivitis and bulging eyes. Since their metabolic rate is affected, patients will typically be hyperactive and show increased energy. On the other hand, they will constantly feel tired. They may also suffer from tremors, hypertension, increased sweating, heat intolerance and insomnia. Sometimes, they will experience muscular weakness and muscle degeneration. Since this is an autoimmune disorder, doctors are not sure what exactly causes it. In Graves’ disease, the patient’s body mistakenly attacks the thyroid gland and stimulates it to make excessive amounts of thyroid hormone. In some cases, a viral or bacterial infection may activate antibodies, which cross-react with the TSH receptor. There is no cure to Craves’ disease. No known treatment can prevent the immune system from attacking the thyroid gland. However, there is some kind of treatment for Graves’ disease, but it is completely based on controlling the symptoms of the disease and decreasing the production of thyroxine or partially blocking its effects. Treatment typically consists of beta blockers, anti-thyroid medications, radioactive iodine treatment or surgery. The surgery is the last option, and it involves removal of the thyroid gland. After the surgery, the patients will need to take hormonal treatment till the end of their lives. Graves' disease surgery, consequences of losing thyroid? Untreated Graves' disease leads to fatality?